Just when you think the move for government control of health care couldn’t get any worse, somehow it manages to. Last Wednesday, the District of Columbia City Council approved a requirement for all DC residents to purchase health insurance. The mandate would take effect in January, right when the federal mandate penalty drops to $0, as per last year’s tax law. Suffice it to say that the district’s individual mandate did not attract much attention. Unlike last week’s initiative vote on raising wages for tipped workers, or the battle over “right-to-die” legislation in the nation’s capital, restoring the individual mandate has slipped below the news radar screen. Some online searching Thursday found no references to the D.C. Council’s mandate vote in the Washington Post, or (but for a brief blurb in Politico) other online news articles discussing recent developments. A cynic might believe that the D.C. Council acted in such a low-key manner by design. The council did not approve the mandate as a stand-alone bill, but wrapped it into a 297-page Budget Support Act. That bill contains such unrelated provisions as an amendment regarding the Fort Dupont Ice Arena, technical corrections to a supermarket tax incentive program, and amendments regarding civic associations using public schools. Likewise, a press release by the D.C. Council summarizing Wednesday’s meeting contained not a word about imposing the individual mandate, nor did the council website show any stand-alone votes on the mandate itself. This lack of disclosure pushed me to contact my council member, Charles Allen, to find out what had happened at the council meeting Wednesday. Upon hearing that the mandate as passed of a much larger package, I asked one of Allen’s staffers whether this provision had been “snuck in at the last minute.” The staffer said DC Mayor Muriel Bowser had proposed the mandate as part of her budget submission to the council back in March. He then rather sheepishly added that, while people had testified on behalf of other portions of the Budget Support Act, no one had spoken about the mandate specifically. These circumstances make it quite reasonable to ask whether Bowser and the D.C. Council deliberately contrived a set of circumstances to avoid public scrutiny of the mandate. Placing the provision among hundreds of pages of technical and relatively non-controversial amendments—and not even highlighting its approval in a press release summarizing the meeting—seems designed to avoid a high-profile debate. A vote on a stand-alone bill imposing a mandate could create political controversy, so the council may have conspired to avoid it. 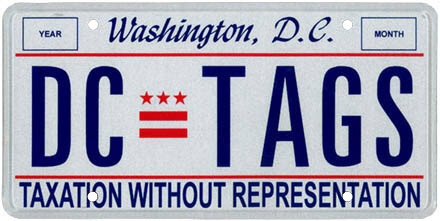 For a district that decries “Taxation Without Representation,” this Nancy Pelosi-esque behavior—where we literally had to pass the bill to find out what was in it—seems to embody the very congressional tactics that DC leaders love to hate. During the 2009-10 debate on Obamacare, the threat of penalties for violating the individual mandate became a source of intense controversy. During the Senate Finance Committee’s markup, Sen. John Ensign (R-NV) received a handwritten note from Thomas Barthold, head of the Joint Committee on Taxation, stating that, under federal law, non-payment of the mandate tax could result in imprisonment. Democrats buckled under this political pressure, removing from the Internal Revenue Service the power to imprison violators, or impose liens on personal property, for non-payment of the mandate tax. If a person determined to be liable to the District of Columbia for a tax neglects or refuses to pay the tax within 10 days after notice and demand, the Mayor may collect the tax, with interest and penalties thereon (and an amount sufficient to cover the expenses of the levy), by levy upon all property (including rights to property) of the person or on which there is a lien provided in this chapter for the payment of the tax. The statute goes on to say that “the term ‘levy’ includes the exercise of the power of distraint and seizure by any means.…If the Mayor levies upon property, the Mayor may seize and sell the property.” In other words, if a district resident won’t buy “government-approved” health insurance, and won’t (or can’t) pay the tax for not doing so, the district has the right to seize, and sell, that person’s property. No wonder the D.C. Council didn’t want to hold an up-or-down vote on just this provision. Another relevant fact to the district’s mandate: The head of the District’s health insurance exchange—which recommended creating a DC mandate following the removal of the federal tax penalty—doesn’t buy exchange coverage herself. As I previously noted, many exchange heads (and Obamacare supporters) refuse to buy the coverage they promote, including the head of the district’s exchange, Mila Kofman. When I discovered in late 2016 that I could not retain that plan in 2017, due in part to regulations imposed by the district’s exchange, I attended a meeting of the exchange authority. I asked Kofman whether she, and other exchange employees, purchased exchange coverage. She claimed that she and her colleagues could not purchase exchange policies, because they would lose their employer subsidy in the process. Only later did I learn that Kofman was paid at the rate of more than $217,000 in late 2016—nearly three times the adjusted gross income I reported to the Internal Revenue Service that year. The idea that a bureaucrat making several multiples of my income would cry poverty, and claim she needed taxpayers to fund her health coverage in addition to her $200,000-plus salary, offended me then, and offends me now. Wouldn’t you know it: I have yet to receive a response. The D.C. Council should pass legislation requiring the mayor, council, exchange CEO, and exchange board members to buy coverage through the exchange—without using separate taxpayer-funded benefits available to other district employees. If the council will not act, the Trump administration could promulgate regulations requiring the CEOs and board members of all state-run exchanges (including the district’s) to buy the coverage they promote and oversee. Congress could also exercise its constitutional prerogatives and strike down the district’s individual mandate, ensuring that no individuals will have their property seized by an overzealous government if they cannot afford to buy “bureaucrat-approved” health insurance. Better yet: The District of Columbia Council could decide to stop micromanaging its residents’ health care by surreptitiously passing onerous mandates in legislation that few district residents know about. Last week’s retirement announcement from Justice Anthony Kennedy, coupled with news placing Brett Kavanaugh, a judge on the U.S. Court of Appeals for the District of Columbia, high on President Trump’s list to replace Kennedy, has drawn attention back to the legal wrangling over the law. Some observers have claimed that Kavanaugh, in a 2011 opinion written when the D.C. Circuit considered Obamacare’s constitutionality, supported the law’s individual mandate. As in many other cases, however, the truth contains more nuance than that simple declaration. Even as he avoided a definitive ruling on the merits of the case, Kavanaugh revealed himself as favorably disposed to the mandate. Worst of all, in so doing, he cultivated a theory that ultimately led Chief Justice John Roberts to uphold the mandate. Kavanaugh’s dissent arose from his belief that the 1867 Anti-Injunction Act precluded the court from deciding the merits of the individual mandate. The Anti-Injunction Act prevents individuals from challenging the validity of taxes in court until after they have paid them, which if applied to Obamacare’s mandate (which took effect in 2014) meant that a court challenge would not ripen until individuals had paid the mandate penalty on their taxes—i.e., in spring 2015, or nearly four years after the D.C. Circuit ruling. Kavanaugh spends the better part of 50 pages—longer than the majority opinion justifying the mandate as constitutional—analyzing the Internal Revenue Code, and the Anti-Injunction Act, to support his belief that the mandate qualified as a tax under the act, forestalling any legal or constitutional challenge until after individuals had paid it. He cautions “the reader that some of the following is not for the faint of heart”—a true enough warning, as much of the opinion devolves into tedium that only a tax lawyer could love. The Supreme Court ultimately disagreed with Kavanaugh’s Anti-Injunction Act analysis. In 2012, Roberts ruled that Obamacare’s individual mandate functioned as a penalty for purposes of the Anti-Injunction Act—meaning the act did not apply, and the court could proceed to decide the merits of the underlying case—even as he concluded that the mandate functioned as a tax for purposes of determining its constitutionality. While Roberts disagreed with Kavanaugh’s reasoning about applying the Anti-Injunction Act to the Obamacare mandate, such differences over the interpretation of a 150-year-old statute hardly rise to the level of disqualifying for a potential Supreme Court nominee. The jurisdictional status of the Anti-Injunction Act reflects the Constitution’s separation of powers in operation. Under the Constitution, Congress possesses the power to tax and spend, as well as the power of the purse over appropriations of money. Congress zealously guards those prerogatives. Here, Congress has not afforded discretion to the Executive Branch to waive or forfeit the Anti-Injunction Act’s bar with respect to the assessment and collection of taxes. Rather, by making the Anti-Injunction Act jurisdictional, Congress has commanded courts to abide by the Act even when the Executive Branch might not assert it. We must adhere to the statutory constraints on our jurisdiction no matter how much the parties might want us to jump the jurisdictional rails and decide this case now….By waiting, we would respect the bedrock principle of judicial restraint that courts avoid prematurely or unnecessarily deciding constitutional questions. After all this discussion of judicial restraint, however, Kavanaugh then spends the last quarter of his opinion “jump[ing] the jurisdictional rails” and opining on the “constitutional questions” that he said courts should not “prematurely” decide. In Kavanaugh’s view, the mandate could fit “comfortably” within Congress’ constitutional powers. Even as he “do[es] not take a position her on whether the statute as currently written is justifiable,” Kavanaugh concludes that “the only potential Taxing Clause shortcoming in the current individual mandate provision appears to be relatively slight” (emphasis in the original). This discussion about the potential problem with the Government’s Taxing Clause argument also shows how easily Congress could eliminate any such potential problem. For example, Congress might keep the current statutory language and payment amounts and simply add a provision as basic as: “The taxpayer has a lawful choice either to maintain health insurance or make the payment to the IRS required by Section 5000A(a)-(c).” Or Congress might retain the exactions and payment amounts as they are but eliminate the legal mandate language in Section 5000A, instead providing something to the effect of: “An applicable individual without minimum essential coverage must make a payment to the IRS on his or her tax return in the amounts listed in Section 5000A(c).” Or Congress could adopt the approach from the House-passed bill, which expressly created a tax incentive and plainly satisfied the Taxing Clause. Any of those options—and others as well—would ensure that this provision operates as a traditional regulatory tax and readily satisfies the Taxing Clause. Conservatives might argue amongst themselves about which is worse: An unelected judge opining on how a mandate to purchase a product could meet constitutional muster, or that same unelected judge giving Congress instructions on how to ensure it will. The gambit worked. Roberts ultimately relied upon that argument from Verilli by way of Kavanaugh to uphold the mandate as a constitutional exercise of the taxing power. That Kavanaugh, like Roberts, used the last few pages of his opinion to decry the “unprecedented” nature of a mandate upheld via the Commerce Clause power does not mitigate his favorable analysis of a mandate upheld via the Taxing Clause power. Other analysts with more experience in constitutional and legal jurisprudence (and perhaps less experience in health policy) can opine on other parts of Kavanaugh’s record. But his opinion on Obamacare, while starting out with an admirable nod toward judicial restraint, unfortunately veered in an activist direction that gives this conservative serious pause. Sen. Susan Collins (R-ME) thinks she has a deal with Senate Majority Leader Mitch McConnell (R-KY) to attach two provisions to a short-term spending bill later this month: The Alexander-Murray legislation to appropriate funds for cost-sharing reduction (CSR) payments to insurers, and a separate bill she and Sen. Bill Nelson (D-FL) have developed regarding reinsurance proposals. Collins also thinks these two provisions will have a “net downward effect on premiums,” even after repealing Obamacare’s individual mandate as part of the tax bill the Senate is currently considering. However, it appears that Alexander-Murray and Collins-Nelson’s net effect on premiums could end up being a nice round number: Zero. As it stands now, both sets of payments to insurers Collins wants—the cost-sharing reductions and reinsurance—could end up subject to a statutory sequester due to the tax bill. In other words, the payments to insurers may never get made, even if Congress passes these provisions on a spending bill this year. In that case, the only health legislation with an impact on premiums would involve repealing the mandate as part of the tax bill—which would raise premiums, not lower them. The statute that created the budget sequester applies a list of programs and accounts not subject to sequestration spending reductions. For instance, the law exempts refundable tax credits, like those provided to low-income individuals who buy coverage on Obamacare’s exchanges, from sequestration reductions. However, neither cost-sharing reduction payments nor reinsurance would qualify as refundable tax credits. They are paid directly to insurers, not individuals, and are not part of the Internal Revenue Code. Also, neither cost-sharing reductions nor reinsurance are on a list of other accounts and programs exempted from the sequester. The Obama administration previously admitted that cost-sharing reduction payments were subject to the sequester, in a sequestration report to Congress in April 2013, and in testimony before the House Energy and Commerce Committee in August of that year. In a separate 2014 report, the Obama administration also admitted that Obamacare’s transitional reinsurance program (which expired in 2016, and which senators Collins and Nelson effectively want to re-create) was subject to the sequester. In fact, the Obama administration violated the Constitution in part because of the implications of the sequester on the cost-sharing reduction (CSR) payments, as a House committee oversight report released last year helps to explain. Because Obamacare’s premium tax credits were not subject to the sequester, but the cost-sharing reduction payments were, the Obama administration combined the two flows of funds—essentially “laundering” the CSR payments through the U.S. Treasury to not subject them to the statutory sequester requirements. However, last year Judge Rosemary Collyer ruled these actions unconstitutional, because the treasury lacks a valid appropriation to pay out CSR funds. The Trump administration last month stopped the CSR payments to insurers, citing the lack of an appropriation. While the Alexander-Murray bill would appropriate funds for the CSR payments, it would do so through the Centers for Medicare and Medicaid Services, not the treasury—meaning that the sequester would apply. Earlier this month, the Congressional Budget Office (CBO) released a letter to Rep. Steny Hoyer (D-MD) indicating that legislation increasing the budget deficit (on a static basis, i.e., not accounting for economic growth) by $1.5 trillion would result in a sequester order of approximately $136 billion for 2018. The existing statutory formula would deliver a 4 percent, or approximately $25 billion, reduction in Medicare spending, followed by about $111 billion in reductions elsewhere. However, because the sequestration statute exempts many major spending programs like Social Security and Medicaid, CBO believes that only about $85-90 billion in existing federal resources would be subject to the sequester. This means an additional $20-25 billion in mandatory spending, if appropriated, would immediately get sequestered to make up the difference. Therefore, if the tax bill passes, any legislation appropriating $8-10 billion annually in cost-sharing reduction payments to insurers, along with $2.25 billion in annual reinsurance payments to insurers, would see insurers get exactly…nothing. All the money would get immediately sequestered under the statutory pay-as-you-go law. On the one hand, conservatives who oppose paying CSRs to insurers may support an outcome where insurers do not actually receive these payments. On the other hand, however, some may view this outcome as the worst of all possible worlds: Having surrendered the principle that the federal government must prop up insurers—and Obamacare—without receiving any actual premium reductions, because the payments to insurers never get made. This scenario, when coupled with repeal of the individual mandate, could result in a legislative outcome that raises premiums next year—a contradiction of the promises Republicans made to voters. On the evening of March 20, House Republicans released two managers’ amendments to the American Health Care Act—one making policy changes, and the other making “technical” corrections. The latter amendment largely consists of changes made in an attempt to avoid Senate points-of-order fatal to the reconciliation legislation. In general, the manager’s amendment proposes additional spending (increasing the inflation measure for the Medicaid per capita caps) and reduced revenues (accelerating repeal of the Obamacare taxes) when compared to the base bill. However, that base bill already would increase the deficit over its first five years, according to the Congressional Budget Office. Moreover, neither the base bill nor the manager’s amendment—though ostensibly an Obamacare “repeal” bill—make any attempt to undo what Speaker Ryan himself called Obamacare’s “raid” on Medicare, diverting hundreds of billions of dollars from that entitlement to create new entitlements. Given this history of financial gimmickry and double-counting, not to mention our $20 trillion debt, some conservatives may therefore question the fiscal responsibility of the “sweeteners” being included in the manager’s package. However, in so doing, this ostensibly “technical” change restricts veterans’ access to the tax credit. The prior language in the bill as introduced (pages 97-98) allowed veterans eligible for, but not enrolled in, coverage through the Veterans Administration to receive the credit. The revised language states only that individuals “eligible for” other forms of coverage—including Medicaid, Medicare, SCHIP, and Veterans Administration coverage—may not qualify for the credit. Thus, with respect to veterans’ coverage in particular, the managers’ package is more restrictive than the bill as introduced, as veterans eligible for but not enrolled in VA coverage cannot qualify for credits.